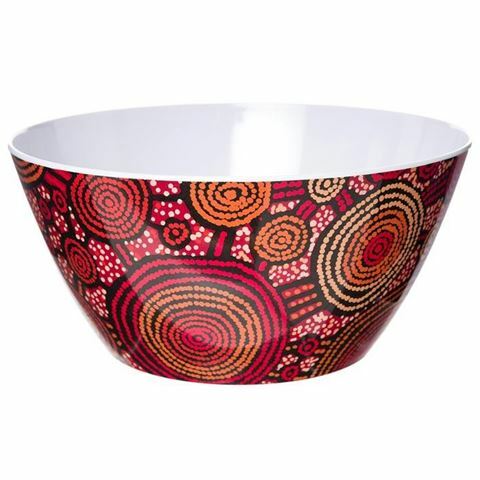 Lovers of Indigenous art will be impressed with this beautiful but practical, melamine salad bowl, which utilises art work by Teddy Gibson, an artist who’s part of the Warlukurlangu artists’ community from the remote desert areas of Yuendumu and Nyirripi in Central Australia. The art work on this salad bowl is from one of Teddy’s pieces entitled Emu Dreaming, which sounds like a fun name for something as playful as a salad. Benefits from the sale of these pieces go directly to the artists and the Warlukurlangu community, which is as great initiative. In the meantime, this beautifully decorated salad bowl will be a standout in any table setting, particularly when dining outdoors. Distinctive Indigenous design – a work of art. Packaged with information about the artist and the art work. Royalties from the sale directly benefit the artist and the community.